The Nokia Asha 305 Dual Sim Phone features 3.0-inch TFT resistive touch screen display with 240 X 400pixel resolutions and is powered by 32MB RAM, runs on Nokia Series S40 OS. 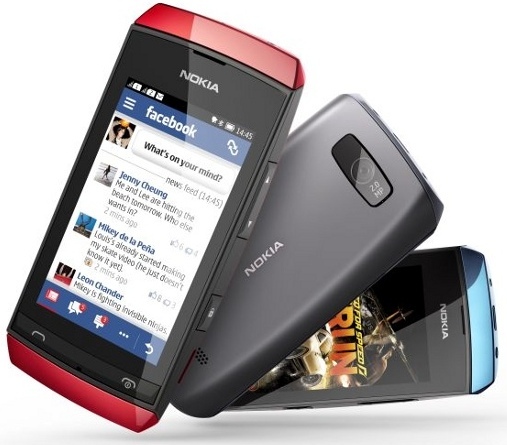 Nokia Asha 305 comes with 10MB of storage expandable up to 32GB Via. microSD card(2 GB included) and sports 2MP rear camera. It has a dimension of 110.3 x 53.8 x 12.8mm and weighs 98gms. Connectivity options of Asha 305 includes Bluetooth v2.1 with EDR, EDGE, GPRS and microUSB v2.0. Color options includes Silver White, Red, Mid Blue, Dark Grey. Nokia Asha 305 comes with standard Li-Ion 1110mAh battery which claims a back up of upto 14Hrs Talktime and upto 528Hrs Standby, 40Hrs on music. The Nokia Asha 305 Dual Sim Phone comes with a price tag of Rs.5,029 INR and will be availabile on 12 Aug 2012. Tags:Nokia Asha 305, Nokia Asha 305 features, Nokia Asha 305 specifications, Nokia Asha 305 review, Nokia Asha 305 details, Nokia Asha 305 availability, Nokia Asha 305 specs, Nokia Asha 305 images, Nokia Asha 305 pics, Nokia Asha 305 pictures, Nokia Asha 305 price.